The Chandler Unified School District is a premier district of choice. Excellence in education starts in elementary classrooms. Chandler Unified School District (CUSD) offers a variety of educational opportunities to our elementary students, enabling each child to reach their full potential, including neighborhood schools with high expectations for students, highly qualified staff and competitive class sizes. 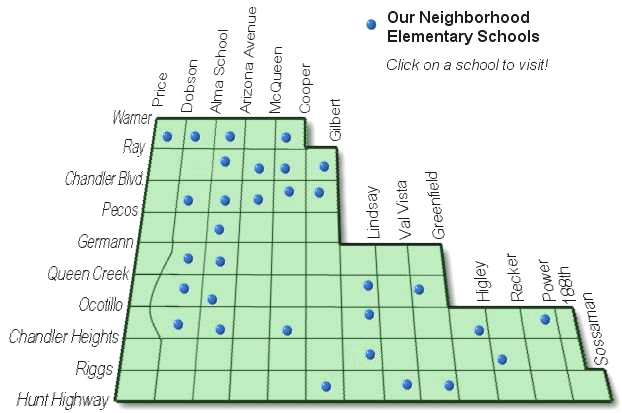 Our elementary students consistently score above state and national averages, and our neighborhood elementary schools have been named A+ Schools of Excellence by the Arizona Education Foundation and recognized as National Blue Ribbon Schools by the U.S Department of Education more times than any other district in Arizona! Scroll down to check out our Elementary School Options or click a menu item on the left to learn more about your many choices and how to enroll. Click on the mascot icon for any school below to find out more about the school. Click here to see our Elementary School BRAGS! Click here for information about Open Enrollment in Chandler Unified's outstanding schools.